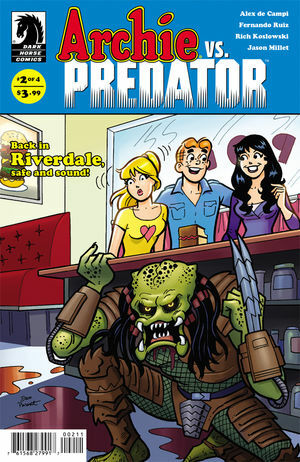 Last time, the Archie gang went on vacation, and the Predator murdered Cheryl and Jason Blossom. He’s stowed away in a trunk back to Riverdale. One of the kids breaks the news about Cheryl and Jason, saying that it looks like some kind of jungle animal did it to them. As the waiter is delivering their welcome back cake, he gets decapitated in a pretty gross scene; you can see his eyeball flying across the room. Everyone flees, covered in blood. Betty and Veronica head to meet someone called Sabrina, who Betty knows about from checking out all the voodoo books at the library. She confesses to Veronica about saying something she shouldn’t have at the shrine in the jungle. Jughead continues to eat cake. At Sabrina’s house, Veronica calls Betty out on all the superstitious things she believes in while they wait for Sabrina to answer the door. Sabrina, who is the Sabrina Spellman, checks out the knife, condemns it as “bad juju,” and tries to perform a spell that will get rid of the Predator, but unfortunately he either knows what’s up or has REALLY great timing, because he smashes through her stained glass window and stabs her, breaking the dagger in the process. Then in another pretty gross panel (somehow made all the more gross because of the cartoony nature of Archie, he rips out her head and spinal cord. The cat tries to protect Betty and Veronica, but he laser blasts it then mysteriously disappears into the night. Veronica changes out of her bloody clothes (Betty was spared, also mysteriously) while the Predator creepily watches from outside. Veronica is under the impression that the Predator is a “ninja with really bad hair.” Her plan is to call all their friends and get somewhere safe, then bat their eyes at the boys to get them to kill the Predator. Meanwhile, behind them, the dagger reforms. They meet up at the school, where some of the kids have borrowed “daddy’s guns,” (a super soaker) and one brought their actual dad, General Keller. He takes a look at the photo that Betty took, and gives us a huge infodump about Predators because of COURSE the army knows about them. He also reveals that the Predator is a TEENAGER, just like our gang! The general thinks he’s targeting Veronica because of her smashing Betty’s nose back on the island. They need to lure him out, but don’t want to use Veronica as bait, so Jughead’s it. Veronica promises to buy him lunch every day for a YEAR. He’s got burgers in his eyes. The general gives the boys a bunch of automatic weapons (terrible idea) and charges Archie with staying back to protect the girls. I don’t know, I think the Predator is going to be able to tell the difference between Veronica and Jughead, even if Jughead is wearing a dress. I won’t reveal the last plot points, but I’m definitely looking forward to the next issue of this weird little mini-series. It’s utterly ridiculous, and I love it. There’s also a really fun bit of art where Betty moves a panel of the comic to one side to hide its contents from someone, look out for that. How exciting! I’ve been wanting to read these!